Leah Mann has always been a hyper kinetic and spacial learner. One of her first memories is of overstimulating her vestibular system and thinking she was flying. She was a competitive gymnast and found her way to dance at a Ft Bragg, N.C., army base and later with a former rockette in a rural suburb of Atlanta. Leah graduated from the University of Georgia in 1985 (BSed). She continued on to the American Dance Festival on a choreography scholarship. Shortly after, Leah founded Moving in the Spirit with Dana Lupton, a fellow University of Georgia graduate. She remains the Artistic Director Emeritus of this award-winning dance and urban outreach program in Atlanta, which has been thriving since 1987 and was named one of the top 10 youth development organizations in the nation. Leah began collaborating with Ela Lamblin in 1993. This collaboration has sustained and evolved Leah’s kinetic spacial viewpoint into a whole body, multi-intelligence, all-sensory way of living and of looking at the world, which is then brought to new life in the physical music of Lelavision. Leah is the co-founder and administrator of Integrated Music, a roster of 12 artists providing music on wards and at bedsides in Seattle Medical Center. She teaches restorative movement to Alzheimer patients at community care centers, emphasizing developmental patterns for brain health. She facilitates personal development retreats exploring hope, resilience and healing using improvisation forms, developmental movement and the exploration of polyrhythms in the body. She also teaches youth workshops to cultivate curiosity and invention using the vehicle of movement and improvisational play. Leah has been a main presenter at conferences such as National Sacred Dance Guild Festival, International InterPlay Annual Meeting, and The Society for Arts In Healthcare Conferences. 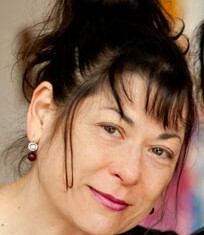 Leah has been awarded numerous grants and commissions from entities such as the NEA Alternate Visions Grant, the Criminal Defense and Justice Project, The Pacific School of Religion, Seattle Arts Commission, Change Inc, Bossak Heilbron Foundation, King County Special Projects, Artist Trust, 4Culture and The Puffin Foundation.